Also for the Mind Bender® goes that it can be grown indoor and outdoor. The parents are a double K.C. 2 with a K.C. 33® and an Afghani like. This plant which could turn red, has sweet buds and a great aroma. height 2.00-2.50 m, yield up to 750 gram. Mind Bender seeds can be now grown indoors as well as outdoors. 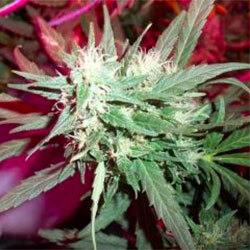 This marijuana strain is easy to grow in pots, she performs well in soil and hydroponics setups. Thorough selection, various lab experiments gave her an ability to resist diseases. 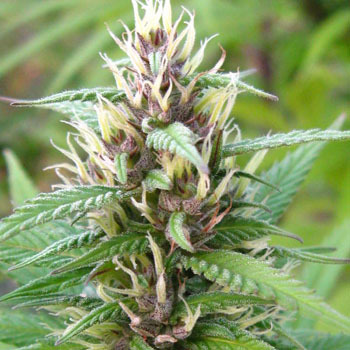 The Mind Bender seeds grow in typically indica way; they are quite short and bushy, with wide dark green shade which sometimes turned red during flowering. The average size of a plant is about 120 cm; however, growing outside, she can stretch up to 2 m. high. Google Mindbender and check out my pictures monster plants monster buds beautiful colors. Yes outdoors in the middle of Wisconsin in the USA this plant finishes by the first weekend of October. Except for the Sativa dominant pheno she finished in November. I’ve only grown this strain outdoors and always in organic soil. There is a Raspberry candy pheno, a lemon pheno which is just like KC33, and a mango flavored pheno, and a Sativa pheno.